The clock said 5:00am and I was super confused. “By hitting me in the face?” I am grumpy like that when I’m awoken in the middle of the night-morning. I get it. Sort of. If I weren’t so grouchy in the night-morning, I’d get up then too. But 5AM? Dan said he went down and she’d been up for a while. He told her she could stay up but we’d have a talk about when was an acceptable time to get up in the future. She’d fallen asleep the night before after 10pm, which meant she’d had less than 7 hours of sleep, which is not enough for an eleven-year-old. And in the day-morning she had a field trip planned with a lot of walking, followed by a band rehearsal and she would be exhausted. And when she’s exhausted, she feels awful and when she feels awful, she is mean to me, because obviously everything is my fault. Because when she is tired, everything I do is suddenly jerkish with jerkishly rude motivations. I didn’t want her to be mean to me and I didn’t want her to feel awful all day, so I went downstairs and told her to go back to bed. Then I laid with her and stroked her back to get her to sleep again. Tonight, we talked about appropriate waking hours. Let’s just say her alarm is no longer set for 4:30 AM. FOUR THIRTY AM, PEOPLE!!! Laylee’s not the only child in this family who likes to take control of her own destiny while simultaneously blaming me for her problems. 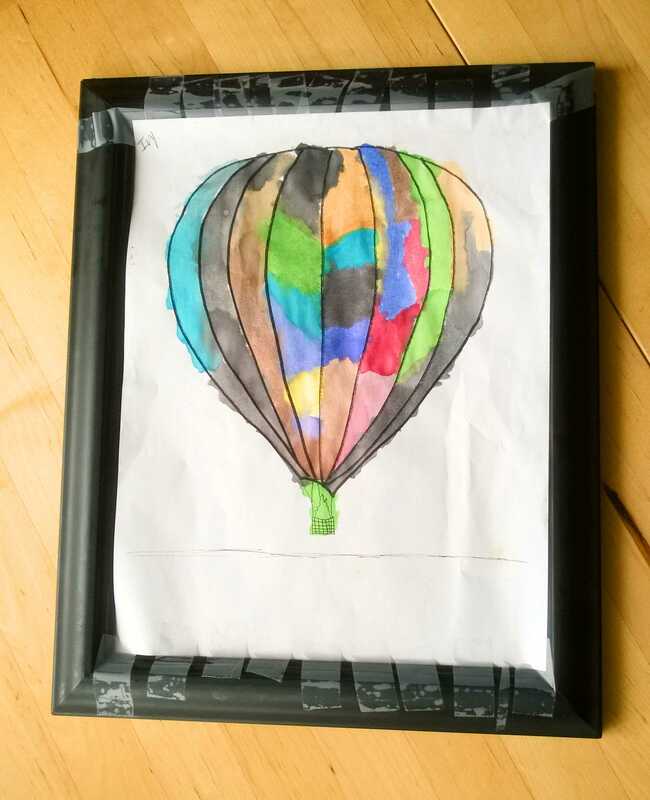 I’ve been telling Wanda that I would frame her hot air balloon watercolor and hang it on our gallery wall for weeks now. I finally got the frame but it’s taken me a few days to actually put the picture in the frame. And as far as blaming goes, yesterday Wanda and I had the following conversation. 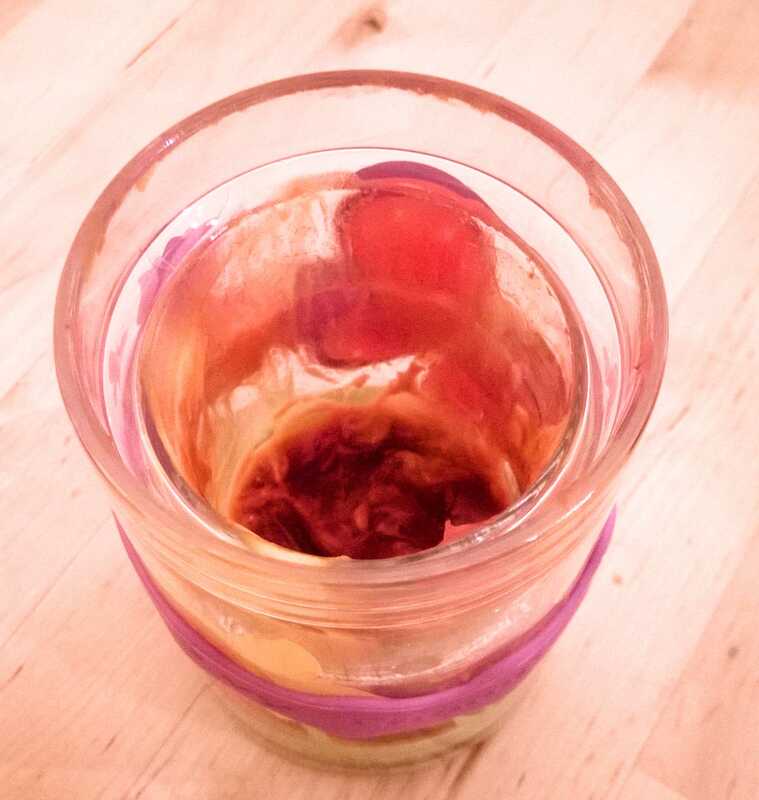 Wanda – Why are my bubbles empty? Me – Because you left the open bottle lying on its side on the top shoe shelf and now my running shoe is full of bubble solution. Wanda – But I wanted to USE those bubbles! I need them back. Me – You can’t have them back. I am rinsing them out of my shoe. Wanda – But those were my bubbles. This is when I disengage. I’m not going to fight with Wanda about how I stole the bubbles that she poured into my shoes or with Laylee about how I could possibly be so mean as to ask her whether she’s practiced the piano. Sometimes motherhood is about molding young people and other times it’s about choosing your battles. Sometimes it’s just about keeping a spare pair of running shoes in the garage. Wanda noticed the moon was up and the sun was going to sleep. She commented that she, quite similarly, goes to sleep at night. This fact is debatable. She goes upstairs at night. What happens there is mysterious, frequently loud, and in no way resembles slumber. I told her that animals who stay up at night are called nocturnal. “Like owls,” Laylee chimed in. Harry did spend an awful lot of time roaming the halls at night in that invisibility cloak. But… he was also awake enough to play quidditch. I’m on the fence about wizards too. We’ll have to ask Carl Linnaeus about that one. I was listening to NPR while I ran errands this weekend, when Ira Glass suddenly started talking about my hometown, the best hometown I know, Calgary, Alberta, Canada. The opening segment of This American Life was about different cities’ failed attempts to build town pride through catchy jingles and slogans. Examples he gave were, “Say Nice Things about Detroit,” and “Baltimore – Charm City, USA.” He said that one city where a PR drive to boost city image and morale had actually worked was Calgary, Canada. He interviewed a man who also grew up in Calgary at that time who said that he and all his friends loved the song and could still sing every single word. They would sing it together for fun. Weird. I had no recollection. At this point I was parked at the grocery store, too overcome with unexpected nostalgia to exit the vehicle. Calgary was a darn stinkin’ great hometown. I was proud to be a Calgarian. The hay bales, the Calgary tower, the missed football catch. All of it came rushing back. But, wait. There was more. Ira Glass told the man he was going to play him a song he’d probably never heard before. The music started. It was “Hello, Calgary.” But no. It was “Hello Milwaukee”! It was the exact same song but with the name Milwaukee in place of my beloved Calgary. Apparently Milwaukee was the city it was originally written for. The Calgary version was just a knockoff. And it wasn’t the only one. I screamed, “NO!” out loud. The guy being interviewed was audibly shocked. He said it was like finding out that the teddy bear you’d grown up loving was owned by 2 other people on the weekends. Then the montage began. “There’s a feeling in the air that you can’t get anywhere except Pittsburg, Phoenix, Knoxville…” It went on and on. Ira said there were over 100 other cities with “Hello” as their theme song but Calgary was one place it really took off. I think it was this point in the show that I clamped both my hands over my mouth in disbelief. I noticed I was sitting like this when the segment ended, pried them off my face and went in to buy groceries. I’m sort of in shock and the song has not left my head for the last 36 hours. The story went from shocking to hilarious when Ira Glass interviewed the composer who talked about how for each version of the song he would travel to the city, spend time there, meet the people and tailor it to their specific community. Ira said he could hear no more changes than the name of the city and one or two geographical details in the lyrics. It’s like that scene from Pillow Talk where Doris Day discovers that Rock Hudson has “written” the same song for her that he’s “written” for every other girl he’s dated. “There’s a feeling in the air that you can’t get anywhere except Calgary” and everywhere else. Ah, to turn on the radio on a Saturday afternoon and have your favorite talk show host smash a tiny piece of your childhood with a mallet, a strangely hilarious mallet. Oh, Calgary. You may not have been the first, but I’ll always know that “Hello Insert City Name Here” was actually written for you. The truth is, there can’t be 100 “best home towns I know” and you’re the winner, hands down. [Listen to the This American Life segment here.] It’s at the beginning of the hour and definitely worth the five minute investment. Maybe it was me. Maybe it was you. But I sure love gno-omes. Garden gnomes in animated films? Meh. But real, serious, ceramic, wood or even resin garden gnomes. I love em. I’ve gotta have em in my life. But they have to be right. They have to be perfect. In short – I have only ever owned two gnomes. And not for lack of trying. I’ve tried to meet a good gnome everywhere. I’ve even considered looking for a match online. Maybe you found your gnome online and I don’t judge you. Lots of people do these days but I wanted to meet him face to face. My first gnome came into my life my freshman year of college. My sister Meg introduced him as a birthday present and he lounged around my dorm and eventually, after Dan and I got married, he was relocated outdoors, where his sunbathing days have turned his blue towel teal and his red suit pink. He’s not the gnome he once was. So, for three years, I’ve been looking for a replacement or at the very least, a better-looking younger friend. Gnome 1 was no longer front porch material. 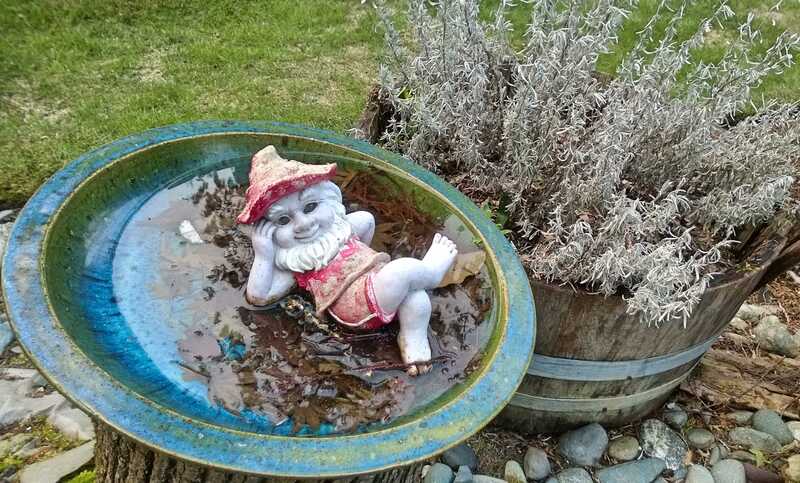 So every gift shop, garden department, and outdoor statuary store I visit, I get right up close to the gnomes, look into their eyes and try to sense a connection. Nothing. Frequently I spot the problem from several feet away. They’re standing or sitting awkwardly or doing a random activity like mixed martial arts or shooting craps or something and I think, I like my gnomes meek and sans gambling addiction. Either that or I look into their eyes and they’re either painted on lopsided, or they are dead soulless voids. I like my gnomes mischievous, but just mischievous enough, not too much. More David Tennant than Martin Short. And I loved him. Past tense. Because on Monday, as I was pulling into my long driveway at a probably legal, but possibly irresponsible speed, I almost hit a deer. I gave the deer a verbal fist shake. Most people hit deer on the highway. Can you imagine the sheer volume of moronity points I would earn for totaling my car in a deer collision… on my driveway? Of course I was enraged at the deer and all of his stupid friends. 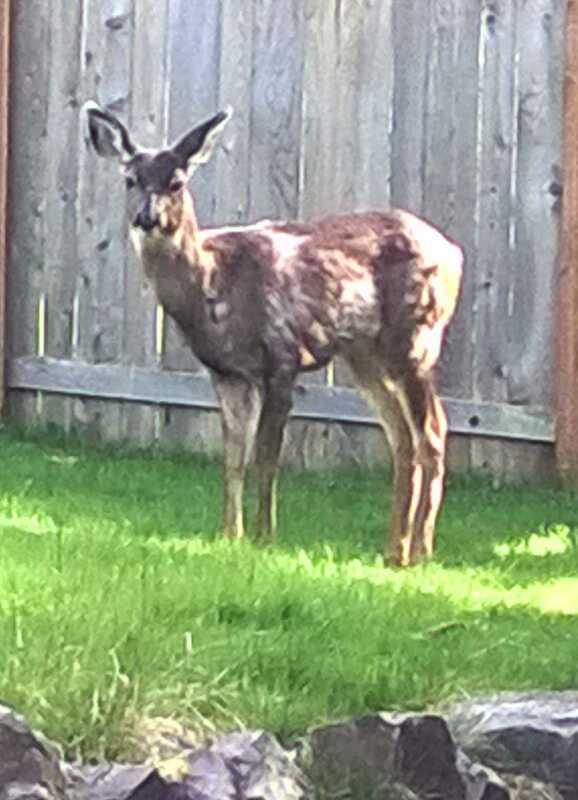 They poop on my lawn, nibble my fruit trees, terrorize my slugs, and eat the onions out of my ghetto swimming-pool-full-of-dirt garden, onions that were only planted because they’re supposed to be deer repellent. I was trying to regulate my near-miss rise in blood pressure by listing Bambi’s many flaws and misdeeds when I noticed a big pile of junk scattered across my front walk. 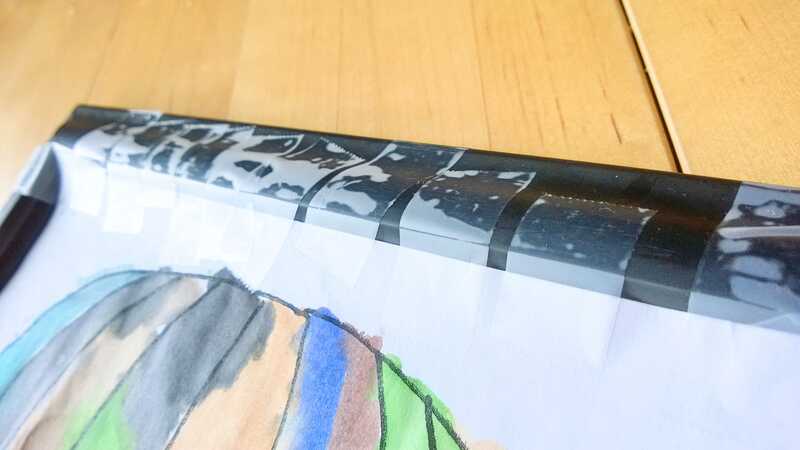 What could it be? I got out of the car and walked closer. 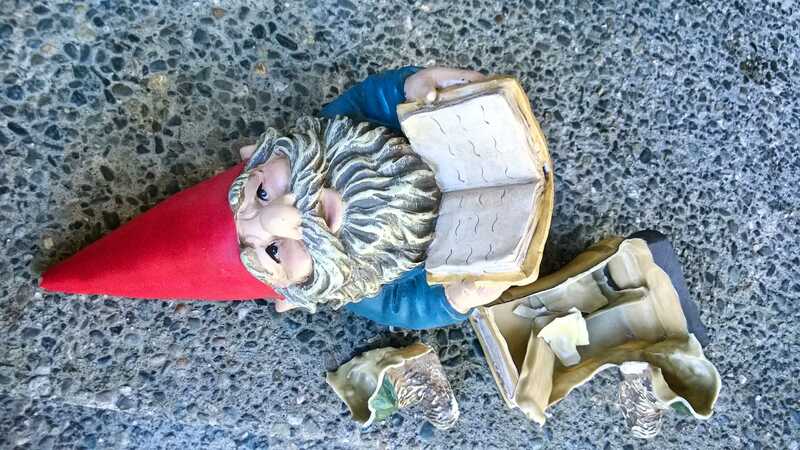 My brand new, highly literate, maxed-out-my-entire-yearly-gnome-budget GNOME WAS OBLITERATED. And the delinquent deer showed no remorse, no respect. I went off on those deer with the vengeance of a woman de-gnomed. Wanda was confused. “Why are you mad at the deers?” She asked sweetly. “Ummm… 8 o’clock,” she replied. No way. No way Magoo would play me like that. Not my own flesh and blood. 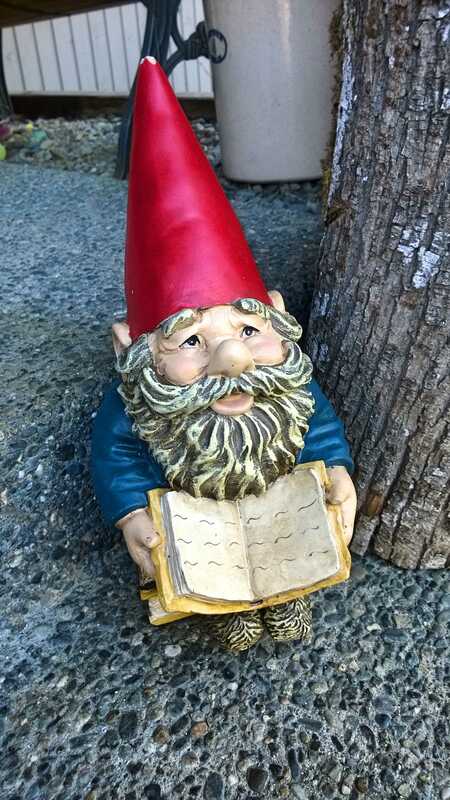 So, I spent the afternoon searching the area around the porch for gnome shards and super-gluing them back together. He’s still missing chunks. When Magoo got home, he admitted to knocking over the gnome and then walking away, like a cool guy from an explosion. What the hay? I talked to Dan. He had watched Magoo lay waste to my dearest garden figurine friend and also walked away. Seeing as we have no more gnome budget for the year and seeing as I love Magoo and Daniel more than I love a resin garden creature, I have chosen to forgive, but I send this plea out into the universe – FOR THE LOVE OF ALL THAT IS DECENT IN HUMANITY, IF YOU DETONATE SOMEONE’S GNOME ON YOUR WAY OUT THE DOOR TO PIANO LESSONS, COVER THE BODY OR AT THE VERY LEAST, SEND A TEXT OF CONFESSION. Consider this a public service announcement. May no one ever. EVER. Come home to gnome shards again. You can make a difference. Be the change. Bloggable things happen but I’m out of the habit of capturing them and then quicker than a Seattle snow storm, they disappear and when I sit down TO BLOG… nothing. So here are a few tidbits from this weekend before they melt. Two – One of my favorite hobbies is telling my kids to clean up their crap off the floor. In fact, to a fly on our wall, it may look like telling my kids to pick up their shoes, backpacks, rainbow loom bands, books, wimples, crisping pins, etc. was my favorite thing ever. It is not number one but maybe in the top eight. Well, today I called Wanda and asked her to put her shoes away. She gave me a response I had never heard before, nor had I thought possible, especially from a four-year-old. The most frequent response from my kids is a sigh. Second most frequent is an eye-roll, often accompanied by laser eyes of rage. What Wanda did was run into the family room, grab her shoes, smile up at me and say, “Thank you for reminding me, Mom. I forgot.” Then she ran and put them in the shoe basket. I’m not making this up. I am not that creative. Three – Sometimes I help Wanda do things. At church today they asked the kids what their parents help them do. One of the three-year-olds I teach said his mom helps him turn on the train show. When I asked him what else she does for him, he said, “Turns on the play-doh show,” and continued listing all the shows his mom lets him “watch.” His mom is a great mom and a domestic goddess, btw, so I knew he was omitting a few key items from the list. That’s why, when the head teacher asked Wanda to share with the entire kid congregation what her mom helps her do, I sat with bated breath, praying she wouldn’t expose me. “My mom helps me become resistant to cranky rants,” or “My mom helps me drink ketchup and mustard,” were possibilities. But no, she said, “My mom helps me clean the kitchen and set up my Thomas train tracks.” Boo-yah! Best mom ever. Usually Wanda cleans the kitchen by herself but every once in a while I help. And today I got credit for it.